On Tuesday, May 22, the Cankarjev Dom in Ljubljana hosted the ceremony for the Trusted Brand award presented each year by the Reader's Digest magazine. This year's winners, voted by the Slovenian readers of this magazine, also include Gorenje. In the domestic appliance category, Gorenje was selected as the most trustworthy brand by more than one half of survey respondents. Gorenje, one of the leading European home appliance manufacturers, was recognized by Slovenian users for the 12th year in a row as the most trustworthy brand in the domestic appliance category. Gorenje thus received this award, which stands witness to the solid reputation and confidence the brand enjoys among the consumers in the Slovenian market, every year since one of the largest European consumer surveys on brand confidence, Trusted Brand, has been conducted in Slovenia. 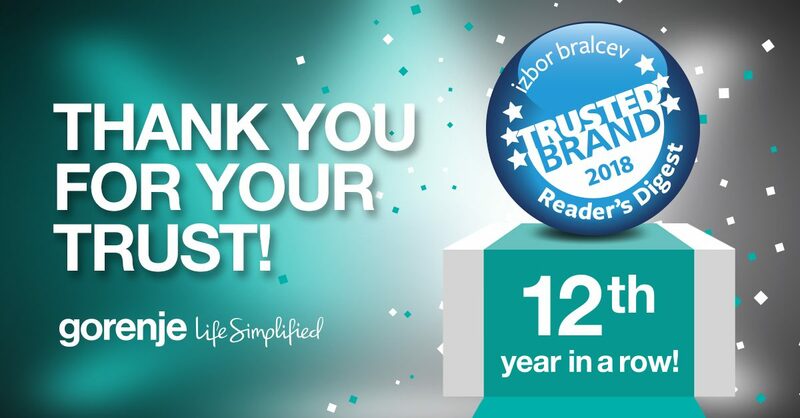 We are honoured to join the global list of brands that enjoy a high level of trust in the local market for the 12th year in a row. We are aware that trust and loyalty are a two-way process. Therefore, Gorenje always strives to make efficient appliances of superior quality, design and technology, in all areas of our brand," said Alenka Potočnik Anžič, head of Gorenje brand market communication, and added: »Gorenje brand's power and competitive edge in the Slovenian market also lie in reliable services and care for the consumer after the sale. We are also looking to boost consumer confidence with the right pricing policy and honest communication with consumers. Therefore, we are all the more pleased to see that the consumers have recognized this." This year's survey, conducted by the Valicon agency, included 5,000 readers of the Slovenian Reader's Digest, who selected the most trustworthy brands, companies, organizations, and personalities in Slovenia. In the domestic appliance category, Gorenje was selected by more than one half of survey respondents (56.1%).